I need coffee. Coffee is very important to me. When my coffee machine died, I cried. 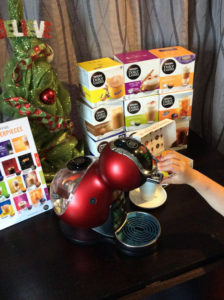 And then the nice folks at Terracycle and NESCAFÉ Dolce Gusto sent me a new coffee machine. And I asked if you could have one too! And they said yes! SO NICE. If you want to win one – just comment below or on the link to this post on my Facebook page. I’ll draw it on 19 December. Thank-you to everyone who entered. Our winner is KAREN OLSON. Congratulations Karen. It’s the same coffee every time. 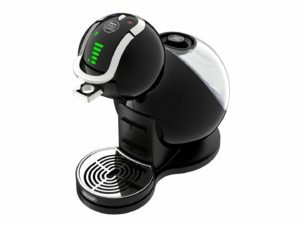 I used to have one of the very expensive Nespresso machines but it broke after nine months of being pounded daily. And I couldn’t get it under warranty because I wasn’t buying the proper pods because they were too expensive. I thought about lying but I’m a really bad liar and I didn’t want to be put into jail or something. So, what can I say about the NESCAFÉ machine? It’s bigger and fancier and it can do different things. Like you can have cold drinks!!!! They have ice tea and stuff like that. SO NEAT. And also you can move the plate your cup goes on up and down. Which is great because I used to just lean my mug precariously against the machine and I’d have to hold it while it poured. Also, you can choose how much water you want in your cup by putting the knob up in down. So you can have a super small strong coffee or a weaker big coffee. You can have milk pods in there so you don’t have to froth milk separately. For the kids they have Nesquick! (I had to Google “kids hot drink with kangaroo on it” to remember the name). The kids liked making the Nesquick but they wouldn’t drink it. Because of course they wouldn’t. But I drank it and it was very nice. There’s not much else to say. The coffee is delicious. I’ve had a bunch of flavors – I like the LATTE MACCHIATO and the CAFÉ AU LAIT. There are so many flavours I haven’t tried yet though – like the RISTRETTO ARDENZA which is like “sweet dried fruits with licorice and juniper pepper” like whhaaaat? They also have CHAI TEA LATTE if you’re into that. All the flavours are here. So the main thing though with pod coffee is recycling the pods because everyone has had that relative on Facebook who has called you Satan for owning a pod machine. 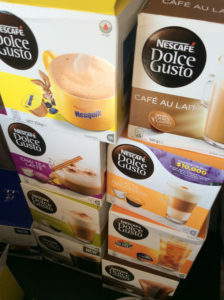 NOW YOU CAN TELL THEM TO SHUT THEIR CAKEHOLE because: NESCAFÉ Dolce Gusto are one of the few brands that are sponsoring a national coffee capsule recycling programme! They’re doing this with Terracycle. From their website: TerraCycle is an eco-friendly recycling company that has become a global leader in recycling typically non-recyclable waste. TerraCycle offers free recycling programmes funded by brands, manufacturers, and retailers around the world to help you collect and recycle your hard-to-recycle waste. Print off a pre-paid postage label from Terracycle and post your pods! Told you! Easy! It costs you nothing – and for every pod you recycle, Terracyle will give two cents to a charity or school of your choice! Isn’t that great? The Collective Suckies Recycling Programme. Here’s the CEO and founder of Terracycle Tom Szaky explaining the mechanics of the Dolce Gusto Recycling Programme with a bunch of happy white people drinking coffee. 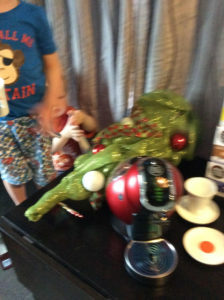 Here is what the coffee machine you will win actually looks like without kids on it sticking their hands in the water bit. I don’t know if it will be that colour though…mine is red. Yours might be red. I just don’t know. Because I’m not posting it to you – they are. But anyway – You’ll get a brand spanking new one with lots of flavours! So tell everyone you know to enter!! My goodness I’m so excited about this machine especially that you can do cold drinks so perfect for summer!! It’s my hubby’s birthday on Christmas Day so I couldn’t think of a better gift. I love coffee too. I love GOOD coffee. I think we Kiwis are pretty lucky (and pretty coffee “wise”) and we don’t mistake Starbucks for real coffee. Mmmmm… coffee. I think I said on FB I’d give this to my parents but actually, I think I’d give this to my lab (my workplace). It would live in our office and we could have coffee whenever we want. The pod system for coffee and milk would make it REALLY simple for us. Simple but good. Coffee is important to us geneticists. This year, we started out having coffee at the Uni staff club on Tues and Thurs afternoons. Then it switched to Mon, Wed and Fridays. Now the notice just says “Coffee: All the Days”. If this came to my lab, it would provide sustenance to one Professor, one lab manager, 6 Assistant Research Fellows, some PhD students, and the odd summer student (if they were good). 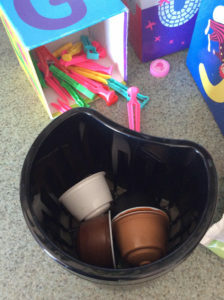 That’s so awesome – I didn’t realise you could recycle them so haven’t bought one of these pod machines …but I make a terrible cup of instant coffee, so it would be such a great addition to my life! Would be neat to drink a coffee from my new NESCAFE Dolce Gusto while reading Emily’s new book (freshly ordered). Much better than the trice-microwave-reheated insty coffee I usually drink while ranging my two darlings and my barely-alive at 7am hubby. We would love this! Sounds amaze balls! Coffee is like my best friend everrrrrr! And fab you can recycle the pods. Omgosh would love to win! 😀 Such a bonus that you can recycle the pods!. I would love this. My son has decided that sleep is a plot to stop him from dominating the world and plunger coffee seems to be beyond my intellectual ability. It looks like something out of the Jetsons! If I win this it’s going to my awesome sister in law’ Sarita who has three kids under 5 and could definitely use some sweet, sweet coffee! Oh my gawd this would be amazing. I could definitely do with 30 seconds between me and my coffee – the whole family would be happier! I *need* this. Ok thanks bye. Coffee is life, because kids. The end. Wowza it is super fancy looking. I love the idea of fast coffee that tastes good everytime!!!! Going to be keeping fingers crossed for this one. Ohhh I sooo want to have one! O e of those things I could never buy…sigh. I love the fact that you can mail the pods for recycling as that is one thing my city doesn’t recycle. What a great concept! I seriously need this in my life, seriously!!! And if I won it I would love it like my own child. I need this. I currently exist on granulated instant coffee and it’s just terrible. This would be awesome. I’m the only coffee drinker at home so if I buy plunger coffee or the like it goes stale before I finish it all. This looks so fancy and also kind of reminds me of bird on a stick thing from the Simpsons. I am coffee. This machine would complete me. Wow how generous is that! My grandmother always said “never stop learning, you need to learn one new thing every day”. Today my new thing is the recycling pod thing, I never knew that! Thanks for the “real” blog posts Emily. I love coffee and buy too many takeaway ones…love how this helps with the recycling issue too! So yes please! 1. Making a proper coffee would drive me nuts as I would get obsessed about every step (is the grind right for the humidity?). 2. I did buy a pod machine but being constantly broke, I got a horribly cheap thing that produces something that tastes of something … chemical. After following directions to flush it with vinegar 10 times or so I gave up on the damn thing. It’s a $200 thing that can burn you. 3. I felt guilty buying the pods. OMG yesss this would be incredible!! This would be such an amazing Christmas prezzy. I’m off work for the holidays and miss the coffee machine! Very cool. Happy thatbthe capsules can be re cycled! I’m a new mum (4.5 months ) and hubby and I are living by back home with mum temporarily. This machine would definitely help with my much needed daily “mama needs coffee” coffee hit! I’d be compelled to blog about every flavour of coffee, might see me good fir another thousand posts or so. 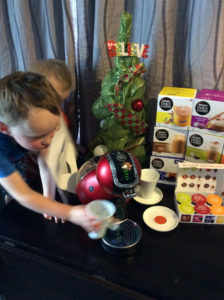 I never used to be much of a coffee fan … this changed a month ago with the arrival of my son! Instant does the trick but why not take the step up to something a little bit fancy! Then all I would need would be a coffee delivery elf to bring me top ups as I sit on the couch feeding my son. Would love to win. I love that they offer recycling for the pods! That was a major concern for me and why I’ve been resistant to getting one of those machines. It’s so fancy! I’d love to have one. This would be incredible for me as I’ve got a 5-month-old baby and am drinking a LOT of coffee these days! Thanks for telling us about the pod recycling – fantastic! Yes please! This would be awesome!! And the recycling is nifty. Please can I enter for the draw? Sadly, I don’t need this amazing thing between my work machine (we have several types including nespresso) and classic home filtered drip. But I know a local refuge that could use a xmas pick-me-up coffee machine.